If otters love to play, they love to eat even more. Most animals wolf down their food as fast as they can. No so with an otter. Occasionally one would catch a small fish or a crayfish or some other delicacy. Sometimes the otter would swim around on its back leisurely eating the prize, but usually it would find a flat rock, stretch out and devour the prey slowly in small bites, savoring every morsel. I was reminded of a gourmet diner enjoying a delicious meal. It almost made me want to catch a crayfish and sample the fair. Cooked maybe, but definitely not raw and whole, shell, legs, antennae and all. I once paddled down river on a boogie board with the idea of finding their den, but to no avail. If any of us moved more than 20 meters or so downstream, all of the otters would disappear and not return until another day. 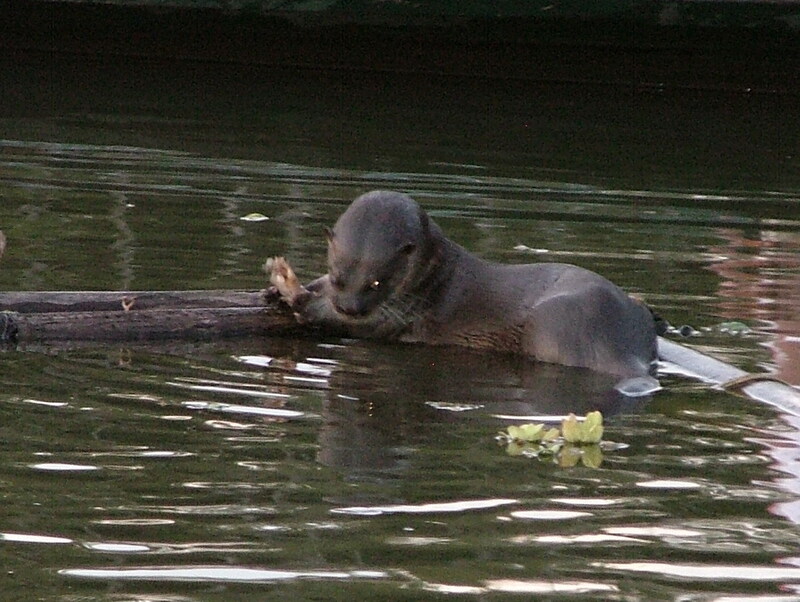 Otters are normally quite shy, but these became so accustomed to our presence that they lost their timidity. But only if we followed their rules — no closer that four meters, and no swimming downstream. Today we often observe otters in the mangrove estuary and other waterways of the Hacienda Baru National Wildlife Refuge, but none so friendly as our old friends on the Barú River. All the otters I have seen in other places have immediately dived upon detecting my presence. 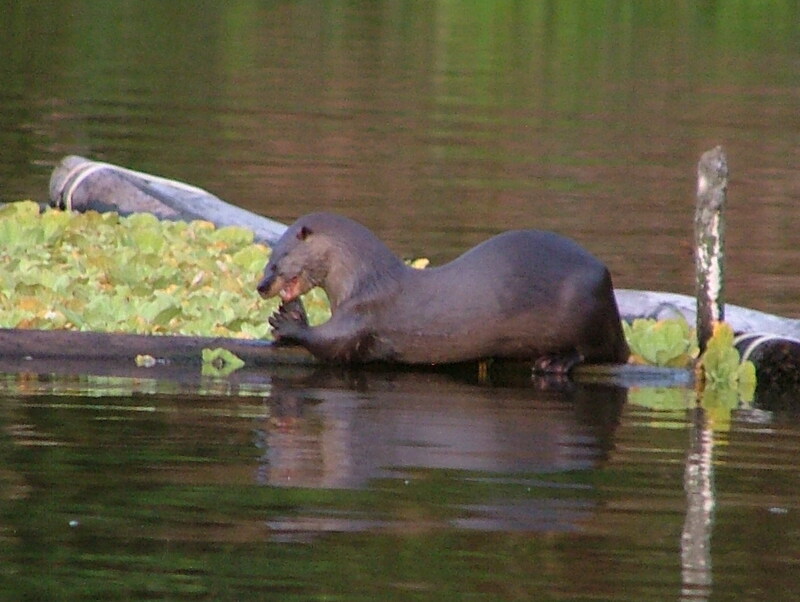 The otters can still be seen on the Barú River in the area around the mouth and as far up river as Villas Rio Mar. If you would like to see them, go to the river bank or even the bridge, around 6:00 AM or 4:30 PM. Scan the surface of the river and look for a sleek, dark, brown head moving across the surface. Right now, in March, is the best time of year to see the otters, when the river is low, calm and clear. If you really want to see them I recommend that you go soon, because next dry season may be too late. Little do the otters know that their river habitat is in grave danger. At this time there are six applications pending for gravel mining concessions in the Barú River. 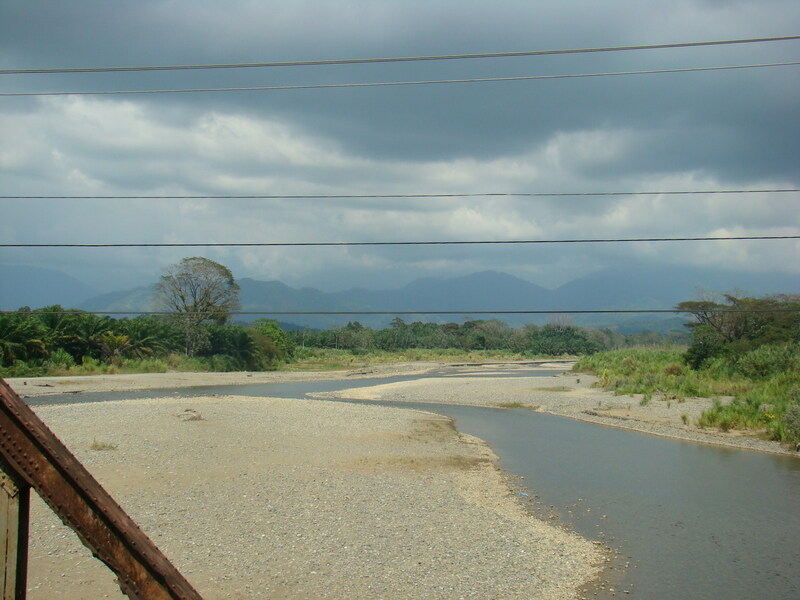 The areas being requested range from the mouth of the river to above the crossing on the road to Nauyaca Waterfalls. If all of these concessions are granted, the Barú will become a riverine waste-land with a non functional ecosystem. If you want to see an example of what is about to happen to the Barú, just take a short drive to the Naranjo River on the Costanera a couple of kilometers south of the Quepos airport. Or if you happen to be in the Osa Peninsula check out the Río Tigre. Take a good look at the results of many years of gravel mining in a river and ask yourself if you would like to have a similar view from the Barú River bridge. Ask yourself if visitors would want to stay in Dominical after driving across a river with a view like that from the Naranajo or Tigre River bridges. The Naranjo River has already suffered grave damage and may be past the point of no return. Additionally there are a number of applications for concessions on the Savegre River, but these are temporarily on hold due to overwhelming opposition from local communities. Another thing that has helped considerably in the battle to conserve the Savegre is the existence of extensive biological studies which verify the high level of biodiversity of the river. Here’s what happens when a sand- and gravel-mining operation – called in-stream mining — excavates the bed of a living river. Removing material causes an immediate change in the existing river geometry, which refers to the shape and course of the river. It includes all the little meanders and pools, the riffles, rocks, bars and bends, as well as the streamside vegetation. In-stream mining destroys this geometry and replaces it with a relatively flat surface. This simplified geometry increases the velocity of the river, which in turn increases the erosion. The faster-flowing water tends to spread out the rocks and sand and gravel in the river rather than deposit it in bars and riffles. This eliminates the deep holes and slow- moving areas, leaving the creatures that rely on the deeper water to survive without homes. The greater erosive force of the altered riverbed creates more erosion along the outside of bends in the river and increases the rate that the river meanders, or moves around within the riverbed. This increases the sideways erosion of the river even more. Increased erosion soon leads to loss of the riparian (or streamside) environment, a unique habitat that bridges the land and water, made up of species that generally exist only along the riverbank. These species not only provide unique vegetation and fruits for the environment, but they also have roots highly adapted to holding the riverbank in place against the erosive forces of the river. If the in-stream mining doesn’t directly remove this streamside vegetation, the increased erosive force of the mined river will. Not only are the homes and food supply of the animals gone, but the big holes under cut banks that were protected by overhanging roots are lost as well. Riverbed mining has impacts that reach far beyond the bed of the river. The river is the heart and circulatory system of a regional ecosystem. If the river is damaged, or removed, the damage impacts the ecosystem around it and does not go away when the mining stops. The alteration of the riverbed feeds on itself and can become more destructive with time, even extending to the headwaters of the river. This is called an environmental feedback. As more damage is done to the river, the impacts on the surrounding area increase. Biodiversity is drastically reduced and species eliminated. The cumulative impacts degrade the river and the entire system around it, including forests, agriculture, and human communities. It can have a disastrous effect on aquifers and water supply. It will also impact the vitality of the zone around the river mouth including reefs, mangroves, and fisheries. The sad part of this story is that in-river mining is not necessary. Large deposits of sand and gravel exist in many places near rivers and along the coastal plane. Materials for roads and construction don’t have to come from our rivers; they can be mined from beneath pasture and farm land where the ecological damage will be much less. Most developed countries prohibit in-river mining. The reason our rivers are under assault is that rivers are public property and the concessionaire doesn’t need to purchase the land in order to mine it. He only needs to acquire the concession, and these are relatively inexpensive to obtain. Short term profits are high, and this makes in-river mining attractive to all kinds of opportunists. Over the long term, however, out-of-river mining is more profitable, and our rivers will be allowed to remain intact. Once every other year, Columbia and Yale Universities publish the results of a study called the Environmental Performance Index in which they rank 163 countries according to their conservation record. Costa Rica placed third in the overall ranking in 2009. The Costa Rican daily La Nación published an article about this distinction. In the article they had a beautiful picture of Nauyaca Waterfalls on the Barú River as an example of the natural beauty of the country. I wonder if the publishers of La Nación or the readers of the article have any idea what the future holds for this beautiful river. There is still time to stop the destruction of the Barú River. Don Lulu Jimenez of Nauyaca Waterfalls has taken the lead in the battle. The board of directors of the Amigos de la Naturaleza del Pacífico Central y Sur (ASANA) has given the protection of the Barú River top priority. The most important necessity at this time is to acquire financing for a scientific study of the ecosystems and biodiversity of the river. This helped stop the concessions on the Savegre River. Communal organizations like the Dominical Development Association (ADI) and the Association for the Administration of the Dominical Water System (ASADA) are also firmly opposed to gravel mining in the Barú. 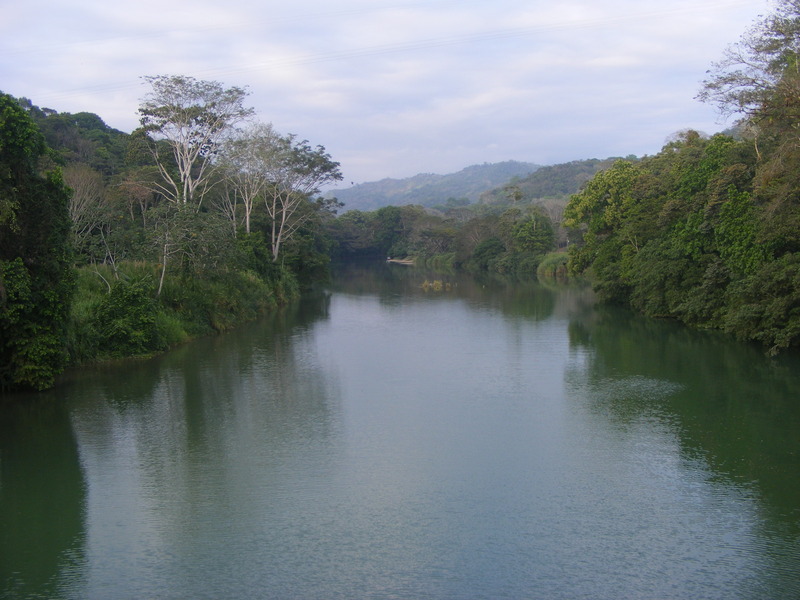 The Barú is still a relatively pristine river with no major source of contamination or extensive ecological damage. Hopefully the communities that have come to love the river will persevere in its defense. Go stand on the Barú River bridge in the early morning. Look up and down that beautiful river and ask yourself if the view is worth saving. And, while you are there keep an eye peeled for my old friend the Neotropical River Otter, and ask yourself if he is worth saving too. I hope you decide that he is, because I’m not ready to say goodbye to my old friend.